People who use a vertical gaming mouse on a causal basis may not know how important they are. However, anyone who uses them consistently will be able to tell you why they’re so important. They feature a design that allows you to relax your wrist and forearm, and this can lead to a higher comfort level over a period of heavy use. If you’ve never had a vertical gaming mouse, this is for you. We’ll review the top 10 vertical gaming mice available including pros, cons, and specifications. Our short buyer’s guide will tell you all you need to know about buying the best vertical gaming mouse for yourself. Why Use a Vertical Gaming Mouse? Repetitive motions with your wrists or hands can lead to painful medical problems over the course of a few years. Things like carpal tunnel syndrome and repetitive stress injuries are common. If they progress far enough, they may even require surgery to fix. This is why a vertical mouse is so important. Gaming mice usually have between four and eight buttons that you can program to perform simple tasks with a click. You do want to pay attention to where the buttons are positioned on the mouse. This will give you a good idea of how easy it will be to operate them when you need to. Not all vertical gaming mice work with all operating systems. You want to pick one that you know is going to work with whichever operating system you have. A lot of these mice work with Windows, MAC OS, and Linux. At the very least, it should work with Windows and MAC OS. DPI stands for dots per inch. This measures how fast and how accurate your mouse is when you move it. The higher you set the DPI, the more sensitive your mouse will be to movement. This is important for people who do precision work or gaming. Do you want your mouse to run wireless or on a cord? A cord can be more restrictive in terms of movement. But, you’ll have greater connectivity because it’ll plug right into your machine. A wireless mouse allows for greater movement, but it can connect less and less the farther away you get. This highly sensitive vertical gaming mouse has 1,000/1,600 DPI Resolution Optical Tracking Technology built in. It gives you next and previous buttons as you get the convenience of a webpage scrolling experience in a mouse. You get a 4.9 foot USB cable attachment as well as an 18-month guarantee. Additionally, you’ll also enjoy free lifetime tech support when you purchase this mouse. 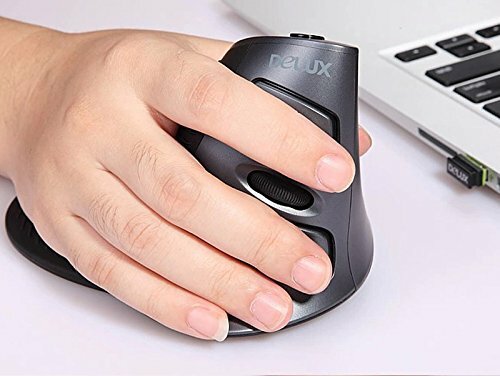 This vertical mouse comes with three different DIP adjustments. It is designed to be a plug and play model without having to worry about any additional installation process. You’ll get an anti-sweat and anti-skid base design that is removable as well. This vertical mouse comes in three different style choices, and the lighting makes it easy to see. 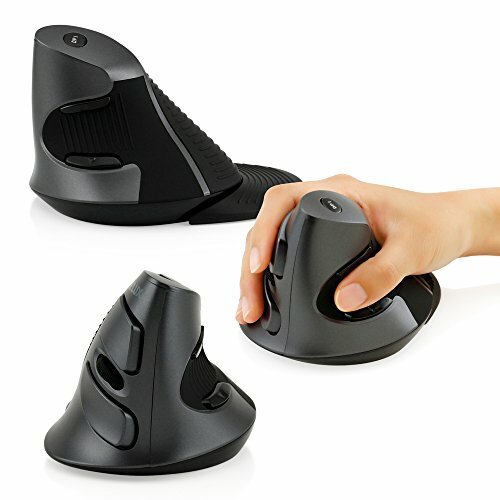 This vertical mouse promotes healthy hand positioning and a comfortable grip. It features a wired design with plug and play capabilities. This mouse is compatible with all Windows systems as well as Linux and Mac. It has adjustable DPI settings as well as a one-year warranty against defects or damage. It also has forward and back buttons built in for your convenience. 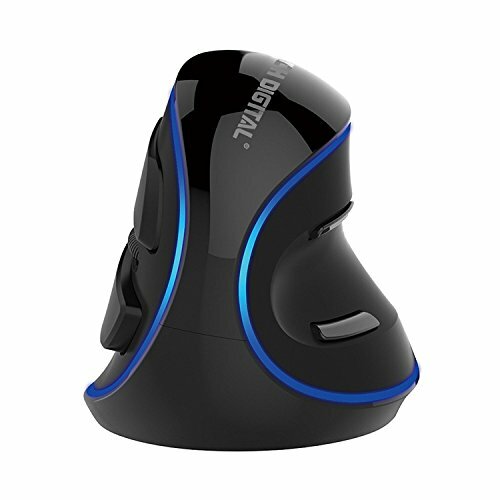 This wireless vertical mouse features an ergonomic design. It is capable of working up to 45 feet away from the USB plugin because it’s wireless. It has a plug and play design with three different cursor speeds so you can customize it to suit your needs. You’ll also get an automatic power off after your mouse has been inactive for a set period to save the batteries. This mouse has laser sensing technology built in for excellent response time and pinpoint accuracy. It is a very compact size that makes it easy to carry and move around. 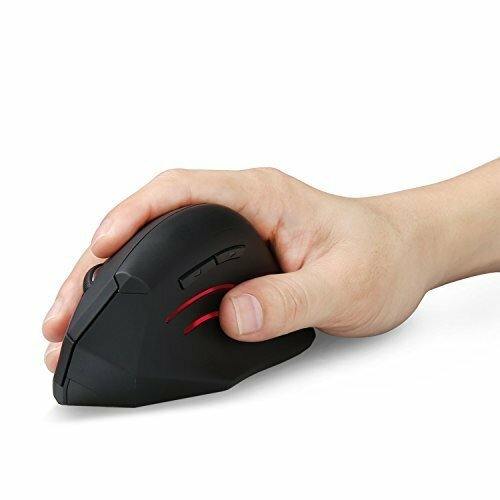 This mouse is also wireless and you can use it at greater distances than a traditional wired mouse can reach. You also get a forward and back function key that is easy to press. This mouse features a sleek design with buttons that stick out so they’re easy to locate and use. This wireless mouse runs on batteries. It also features a removable palm rest that encourages you to keep your hand in a healthy position. 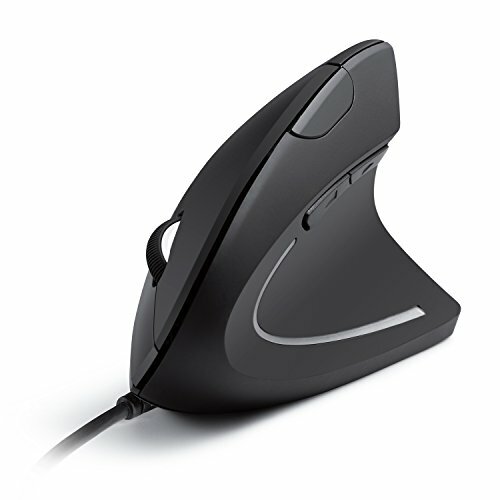 It has an adjustable DPI setting that allows the mouse to glide over several different surfaces quickly and easily. 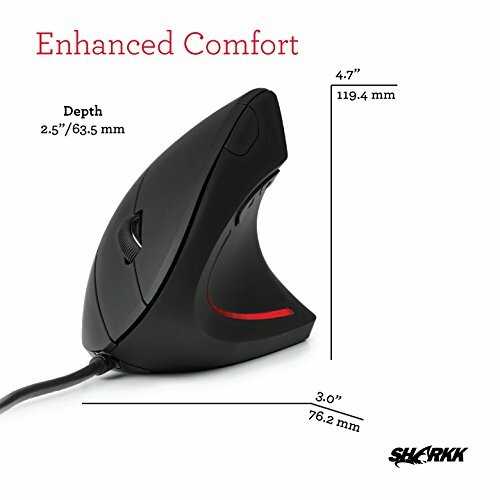 You’ll get a comfortable 75-degree vertical angle when you use this mouse. It has four adjustable sensitivity levels that are guided by a laser so you get pinpoint accuracy when you use it. It comes with six buttons and four different bright LED color choices. You get a six-foot braided cable for extra durability and reach. It supports a wide variety of operating systems as well. This vertical mouse is designed to fit to your hand comfortably. There are five easy to reach buttons. You don’t have to contort your arm to reach them. You can choose from three different sensitivity levels that give you a smooth and seamless experience. 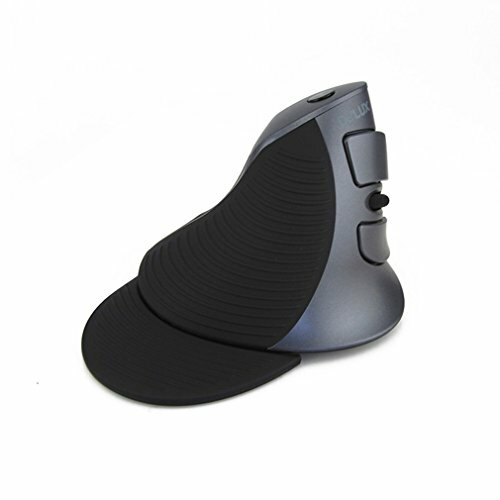 The mouse and the palm rest feature no-slip grip with ridges. Additionally, the palm and wrist rest is removable. 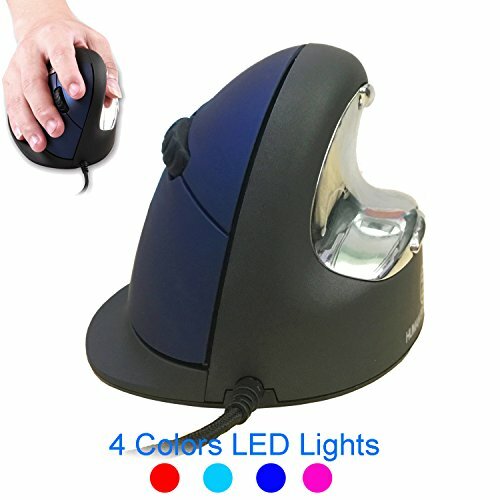 You can buy this mouse with three different bright LED light options. It has five easily adjustable sensitivity options as well. The buttons are placed so you don’t have to contort to reach them, and they only need light pressure to respond. This mouse features a wide compatibility option that allows you to use it with Windows, Mac OS, and Linux without any issues. This wireless mouse was newly upgraded for 2018. It sits at an 85-degree angle to take the stress off of your wrist and forearms. The Autley mouse comes with four different sensitivity levels. 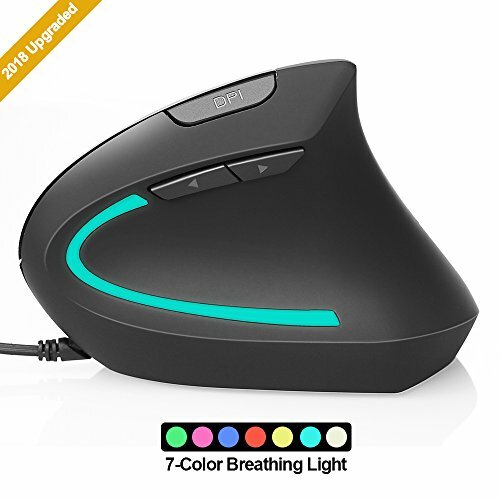 It has an LED light bar that glows seven different bright colors and makes it easy to use the mouse in low light. You get a 60-day money back guarantee and a year warranty when you purchase this mouse.